A GFCO labeled product is considered safe for gluten-free consumers. But what if that same product carries a pre-cautionary allergen label? For more than a decade, the Gluten-Free Certification Organization (GFCO), a program of the Gluten Intolerance Group (GIG), has been leading the industry in the certification of gluten-free products. Differentiating itself from other programs, GFCO certifies the product to 10 parts per million (ppm) or less of gluten, rather than just approving the manufacturing process. Whereas other certifiers rely only on the food manufacturer themselves to provide testing data, GFCO performs both planned and unannounced site audits, and does its own testing of products directly off of the store shelves. These stringent processes have earned the overwhelming trust of consumers and makes the GFCO certification label the most recognized symbol in the gluten-free community. Despite this track record, there are still occasional questions about the safety of foods carrying the GFCO certification logo. The Food Allergen Labeling and Consumer Protection Act of 2004, or FALCPA, along with Precautionary Allergen Labeling (PALs) are often the cause of consumer confusion. FALCPA only named wheat as an allergen source, contrary to gluten-free labelling standards that also recognize barley, rye and other hybrids. 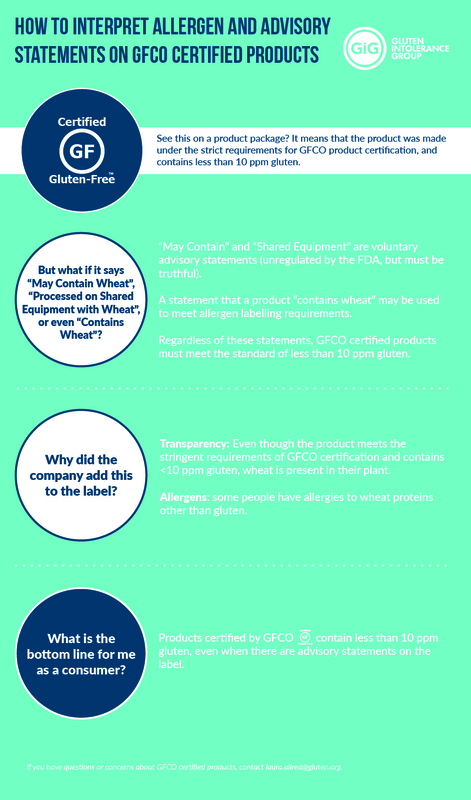 In addition to these differing definitions, Precautionary Allergen Labeling is sometimes used by manufacturers to provide transparency to their consumers. Examples of PALs include “may contain” and “shared equipment” statements. In cases where wheat is used on product lines in other sections of the manufacturing plant, GFCO assigns cleaning and additional testing requirements on the all equipment used, along with extra product testing to assure the integrity of our 10 ppm certification. The takeaway for consumers is that PAL statements are voluntary, not regulated by the FDA and do not invalidate GFCO certification. GIG and GFCO continue their hard work of educating the gluten-free consumer on these definitions and statements but the organization is doing even more to assure consumer safety and trust. In an effort to be transparent with all gluten-free consumers, a Safety Alerts section has recently been added to the GFCO web site. When GFCO is made aware of any product recalls or incorrect labels, announcements are made through this site page as well as over the organization’s social media channels. In addition, an open Facebook Group called the GIG Food Certification Forum was created as a place where consumers can directly ask their questions concerning GFCO products and labeling. These actions, along with the certification processes that are the most stringent in the industry, is what differentiates GFCO from their competitors. The GFCO certification is what the community is looking for when buying items in their local stores. Having the GFCO logo on the package trumps any other labeling statements that may be found, and helps to define the safety of the product for millions of consumers.